Wendy Mewes, author of this excellent guide to cycling the Nantes-Brest Canal, has this overview of cycling around St-Malo, one of the gateways to cycling in France thanks to its ferry port. 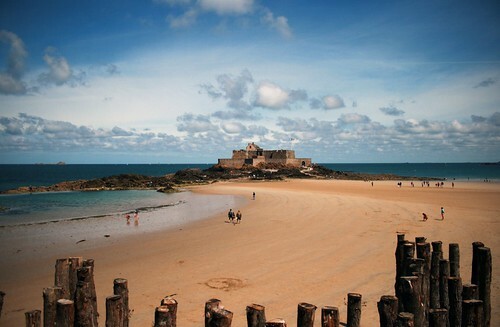 St-Malo is best known as a ferry port on the north Brittany coast, with a Brittany Ferries service from Portsmouth. The approach by sea reveals the town’s great glory, a walled city or ville close, jutting out into the water. What is really remarkable that this is a meticulous restoration of the original which was almost completely destroyed in WWII allied bombing. Stop off for a walk around the ramparts, past statues of famous corsairs who harassed English and Dutch ships over the centuries such as Dougay-Trouin and Surcouf, and the impressive facades of wealthy armateurs’ (ship-owners) houses. There are great sea views to the islands, including Grand Bé, where the writer Chateaubriand is buried, accessible at low tide. Have a dip in the seawater pool with free access on the beach Plage de Bon Secours beneath the walls. In 1693 the English sent the ‘infernal machine’ – a black-sailed vessel full of gun-powder and bombs - on the night tide towards city. In fact it hit a rock just outside, and although the resulting explosion was heard in Normandy, there was little damage to city except for shattered windows and a rain of metal. The chateau contains the town museum, and the narrow streets of the ville close teem with restaurants and chic hotels. The Corsaire’s house at 5 rue d’Asfeld is worth a look for a sense of the town’s glorious maritime past. The cathedral’s restoration includes fabulous stained glass windows from the 1960s and a stylised metal altar, as well as the tomb of Jacques Cartier, discoverer of Canada. It is possible but not particularly practical to cycle in the very narrow streets of the ville close. Other parts of the modern town are OK. 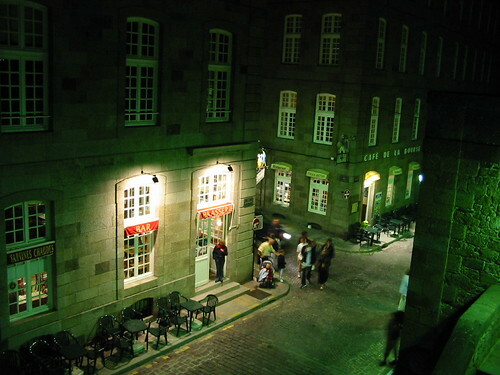 The tourist office on Esplanade Saint-Vincent has a leaflet of a cycling or driving route to visit houses once owned by the mercantile and adventuresome elite around St-Malo. Or hop on the little ferry (bikes accepted) across the river to Dinard, a fashionable ‘British’ resort since the 19th century. A ride eastwards along the coast road will take you to the breath-taking bay of Mont St-Michel, just over the border in Normandy, passing some spectacular scenery on the way via the Pointe du Grouin and the oyster-mecca of Cancale. If you want to pick up a cycle route straight off the ferry, the Green Way V2 (St-Malo–Rennes) starts in nearby Dinard. See our story on cycling Brittany's green ways or pick up a copy of G.H. Randall's Brittany's Green Ways: A Guide to Re-Used Railway Tracks and Canal Towpaths (UK, US, Fr). A Brittany Ferries service from Portsmouth arrives daily. The ferry port is within easy walking distance of the ville close. The railway station, with links to Rennes or Brest, is 850m away. The tourist office can help with finding accommodation. Expect to pay more for hotels within the walled city. The Hotel Le Nautilus is a good average bet, or you can try the Hotel Elizabeth. Something rather special, but absolutely tiny, is the San Pedro. There are also a number of campsites within an easy cycle ride of town. Browse the map below for more bike-friendly accommodation options across Brittany. For bike hire, Concept Velo, 12 rue Théodore Monod, has been recommended to us (good bikes for €11 a day). See also our bike hire listings for Brittany. Restaurant recommendation: Gourmet, La Bouche en Folie, 14 rue de Boyer. Bistro: Le Bistro de Jean, 6 rue de la Corne de Cerf. Crêperies: Crêperie Chantal, 2 Place aux Herbes; La Brigantine, 13 rue de Dinan. See Wendy's Freewheeling France guide to cycling the Nantes-Brest Canal, as well as her history of the Nantes-Brest Canal. She's also written a regional overview of Brittany, and guides to Brest, Rennes, Quimper and Vannes.